The perfect joint care formula. 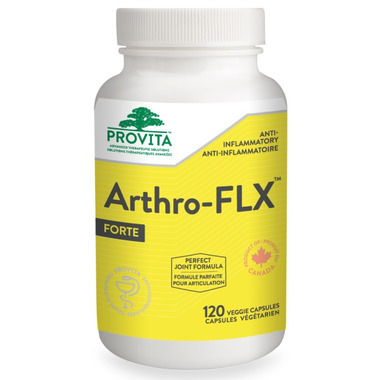 Arthro-FLX Forte has the perfect synergistic blend of ingredients known to help in the maintenance and repair of joint cartilage and in reducing the pain associated with osteoarthritis and joint deterioration. Glucosamine helps to stop cartilage deterioration. Chondroitin and Hyauronic Acid lsupport joint lubrication. Devil’s Claw associated with a strong Boswellia serrata extract and White Willow bark reduce inflammation and pain associated with arthritis. Chicken collagen (type II) encourages the body to produce chemicals that fight pain and swelling. It is also the best available form of collagen for providing tensile strength to the joint cartilage. Joint problems can be very debilitating due to pain caused by the wear and tear of joint cartilage, gravely affecting mobility. If not eliminated, inflammation leads to accelerated cartilage and tissue degeneration. In many cases, surgery is needed. Dosage: Adults take 2 capsule 2 times per day. Caution: Consult a health care practitioner if symptoms persist or worsen. Take with food. Avoid taking at bedtime. May cause mild gastrointestinal disturbance. Consult a health care practitioner prior to use if you are pregnant or breastfeeding. Sealed for your protection. Keep out of reach of children. Keep sealed, store in a cool, dry place at 15–25ºC.